The initial findings of an independent study into the economics of renewable energy confirms the viability and profitability of developments in the Highlands and Islands and the scope for communities to negotiate up to £5,000 per megawatt of electricity production per year for the community benefit. IPA Energy Consulting of Edinburgh were commissioned by The Highland Council and Comhairle Nan Eilean Siar (Western Isles Council) to evaluate hydro, wind and wave power schemes and have produced a preliminary draft report, the highlights of which were presented to The Highland Council’s Sustainable Development Select Committee in Inverness. They will take on board the comments of the two Councils before producing a final report, which will be made widely available to communities and the renewable energy industry. Councillor Ian Ross, Chairman of the Council’s Sustainable Development Select Committee, said: “The study is a comprehensive and very useful piece of work and I look forward to reading the final report. The preliminary findings clearly demonstrate a wide range of renewable energy projects are viable and profitable within the Highlands and Islands – and this is to be welcomed. Earlier, more than 30 community councils were represented at a meeting of The Highland Council’s Renewing Democracy and Community Planning Select Committee, when a draft community toolkit entitled “Can your community benefit from renewable energy development” was presented. The tookit aims to highlight the opportunities for communities to benefit from renewable energy production and use, including how a community can develop its own renewable energy scheme. It also presents options for securing and distributing community benefit from commercial development and signposts sources of community support and offers advice on relevant planning matters and signposts sources of community support. Eager to ensure that communities gain the maximum benefit from the development of windfarms and hydro-electric schemes, The Highland Council is to develop a Highland-wide policy on community benefit and at the same time ensure it continues to influence a national policy on the benefits for local communities from renewable energy. 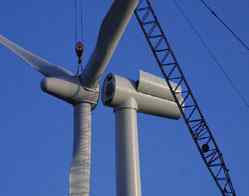 The Council is eager to make early progress on the issue because it has recently approved three wind farm applications in Caithness, Skye and Inverness-shire and has received a large number of enquiries about both wind farms and hydro electric schemes in its area. Influence national guidance, through the Convention of Scottish Local Authorities. The Council has also stated that consideration of planning applications must be distinct from the negotiations governing community benefit. A report to the Council highlighted the Councils position. It concluded: "The Council supports the development of the areas renewable energy resources so that it can play its part in addressing wider climate change concerns. However, this must be linked to providing economic benefits to the local communities that are host to such schemes. Local communities must directly benefit from the use of their local resources. Given the contribution that the area already makes through earlier development of large scale hydro electricity schemes, together with the exceptional quality of the environment, further renewable energy development must pay full regard to local community well-being. The Council therefore looks for these arrangements for securing local community benefit and commitment in order that both national and local interests are addressed."